Bidwell Park is a very large municipal park on the doorstep of Chico. While the lower part of the this long and narrow park (below Manzanita Avenue) is mainly in the guise of a flat and tame city park, the upper part of the park, which makes up the vast majority of its lands, is situated along a wide canyon in the lowest foothills of the Sierra Nevada range right where Big Chico Creek emerges onto the flat lands of Sacramento Valley. The vast majority of the trails in this upper part of Bidwell Park allow mountain bikes and are fairly attractive to experienced riders. The technical features of these trails are the primary reason for this. Bidwell Park also seems to be the venue of a number of significant mountain biking events like races and vendor demo rides. This is a place that is tailor-made for "chunk lovers". If you like rocky trails, Bidwell Park is a paradise for you. The name of the game is "rocky" from beginning to end. Hardtail riders are likely to be punished on this ride. You need fairly plush suspension to be comfortable. I can easily say that 29er or 27.5+ wheels would be better here than 26 or 27.5 inchers. I would say you might want to lower your tire pressure for better grip and a bit more small bump compliance, but that will only work for those riding on tubeless tires and comparatively gentle riders. Aggressive riders on inner tubes may want to keep their tire pressures high if they don't want pinch flats. The trails in this park are so rocky that you often find yourself having to make pedaling effort even when you're supposed to be coasting gently downhill. Think of Rough Go Trail at Annadel but without a break from beginning to end. I was "done" and feeling ready to go home after about the sixth mile of this ride. This is despite the fact that I like rocky and technical trails. Upper Bidwell Park features a very distinctive landscape. This shallow canyon is something like a wide flood valley carved by the river, with low rims on either side that feature short but sheer cliffs and ledges in many spots, while the river itself flows through a deeply gouged canal along the mostly flat the center of the valley. This is not a kind of scenery that I'm very used to and it looked semi-exotic to me, making most of the views available during the ride extra enjoyable. There are parts of the landscape that reminded me of a location such as the Serengeti Plain (not that I've ever been there). The boulder-strewn, gently sloping hillsides outside the valley where small trees are very sparsely sprinkled probably is the source of my impression, especially in their very arid-looking state with the straw-colored grass of fall. The route you see here is a distillation of one of the typical rides that are done in Upper Bidwell. Another typical ride route here would be something of a "rim loop" of Bidwell Park that returns not via the same (northern) side of the river but crosses over to the other side to follow Guardian Trail instead. However, I read accounts describing that part of the loop as very technical, challenging, and exposed. Some photos I've seen have especially discouraged me from trying that. So, I've opted to use this saner loop as a representative Bidwell ride. This ride sticks to the northern side of the river. It's in the shape of an elongated loop that goes back and forth on the trails on that side. I had originally planned a route that was about 15 miles in length for this ride but, after the first couple of miles, when I saw the character of the trails, I decided that it would be better to shorten it. So, I left out one extra spur and an optional side loop that I was planning to do, and shortened it to 10.5 miles. Even in this form, the ride took me three hours to finish. While I'm not a fast rider, this is probably a record even for me. To me, this is the kind of 10-mile ride that feels more like what most other 18-mile rides feel in terms of physical difficulty. I've used a parking lot of the park right off Centennial Avenue as my starting point. This free lot is reasonably spacious. If you'd like to reduce the mileage overhead of getting from this lot to the "real" trails via some paved paths and a road, you can first try your hand at finding a spot in the parking lot (Lot B) right at the trailhead of North Rim Trail. That lot is possibly a bit smaller (I'd estimate it has space for 15 to 20 cars) and has a gravel surface. And there are a number of other parking lots as you can see on the park's official map. The majority of the ride's climbing takes place on North Rim Trail, which constitutes the first segment of this route. North Rim Trail climbs with a very gentle average slope along the northern rim of the canyon as its name suggests. You gain about 850 net feet of elevation over 3 miles on this trail. Thank god its slope is gentle because, due to the rocky trail surface, climbing it still fairly tough. I'd rather be climbing a smooth trail with 10 to 12 percent grade than the 5.5% grade at which North Rim Trail climbs on average, given its constantly rocky surface. To be fair to me, though, for a little under half a mile before the end of that 3-mile climb, the slope deviates significantly from that gentle average and reaches about 9% grade. I would say the climb on North Rim Trail challenges without completely breaking your will. So, it's not a bad way to reach the upper reaches of the park after all. North Rim Trail starts out in the form of a very wide path and stays that way for quite a distance. This seems to be due to a bad case of multipath. It's easy to imagine many riders opting to follow the slightly smoother topsoil surface along the edges of the trail as opposed to the rocky center, ultimately widening the trail as time goes on. In fact, I'm surprised that not all the trails in the park have been subjected to the same phenomenon and widened, because they are more or less equally rocky. In its highest elevations, North Rim Trail finally narrows down and becomes sort of a hillside singletrack that's on the northwestern slope of the bluff, shortly before you turn onto B Trail. 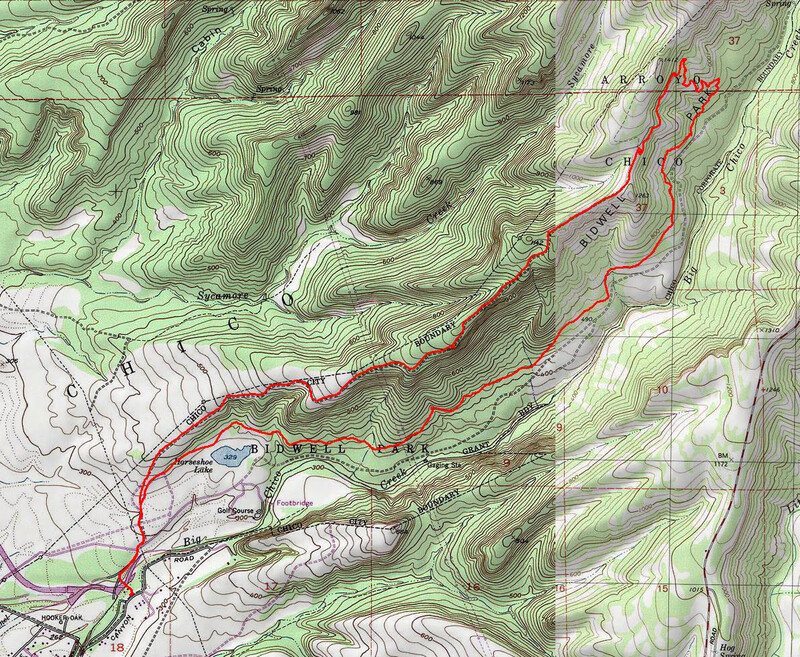 B Trail is marked on the official park map as an "extremely difficult" trail, and that's for good reason. If there ever was a trail that deserves a double-black-diamond rating, this is it. This narrow and rocky singletrack starts out by following along the northern rim roughly in the same direction as North Rim Trail, and even has you pedaling uphill for a few short stretches before it begins a manic, switchbacking, and confused plunge toward the river bed. I think, overall, I walked something like half of the distance on B Trail. This trail probably would be more enjoyable to riders on full-blown downhill rigs. I would have rated the technical difficulty of this ride as an 8 out of 10, if this trail weren't included in the route. On the flip side, I wouldn't be surprised to learn that B Trail was designed with mountain bikers in mind, because in addition to its many challenging technical features, the trail also does some gentle rollers in the rare stretches where it's actually relatively smooth. These seem to be geared for nothing but the enjoyment of bikers. You traverse most of the return part of the loop on Middle Trail. This trail is much more flat on average compared to B Trail. However, in a lot of places, it's no less technical. Still, there are some stretches of Middle Trail where I've been able to manage something like a flow. The trail slowly snakes along the northern bank of the river, back toward the entrance of the park. In its second half, it seems to repeat a particular pattern several times, where it dips into the shallow bed of a seasonal stream, and does this with a fairly rocky descent and a rocky climb back out before becoming relatively smooth again. In some cases, that climb back out even has roughly constructed stone steps (possibly for erosion prevention). Ultimately, Middle Trail brings you to the Horseshoe Lake area, a part of the park's trail network that's used by hikers and joggers with higher frequency. If you like what you see on Middle Trail and would like more of the same, one way to extend this ride is to do a clockwise sub-loop over Upper Trail that partially overlaps with this ride route. This would give you a little tasting of a trail like Middle Trail in character but (I think) in the descending direction, before you continue onto the rest of the loop and head out. Of course, another way of extending or altering the route would be to cross the river to climb Ten Mile Road, which is a tough climb I've been told, and follow Guardian Trail on the southern rim of the valley, as I've mentioned already. That might be an option that I try when I have more time, more water, and a stronger death wish. Incidentally, to cross to the southern rim of the valley, you need to ford the river, which I'm told is a wet crossing that is impassable in the winter. That's part of the reason I opted for this route to represent Bidwell Park, rather than the "rim loop". Speaking of impassable, I should add that the singletrack trails in the park are closed to bikes in wet conditions. So, make sure you check the trail conditions reported on the park's website before planning a ride. There's hardly any tree cover on this ride. The lower parts of B Trail are the only exception to this, where there's a bit of partial cover. You'll be able to find the occasional tree by the trail in whose shade you can take a rest stop, but it won't be a deep shade in most cases. So, this is a ride to be avoided during the hot part of the year, as far as I'm concerned, which is a good chunk of the summer in this particular area, if I'm not mistaken.